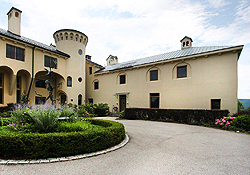 Condominium living located in a legendary castle built in 1890, high above the Hudson River. Impressive open rooms with 12 to 15 foot ceilings, 4 fireplaces, gourmet kitchen, and well appointed baths, combined with a loggia accessed from the main living area and a large outdoor deck accessed from the first floor den make this an extremely comfortable lounge and entertainment area. Central air, security and alarm system, individual heating and hot water systems, generator, heated basement, 2 car garage and your own garden complete the presentation. 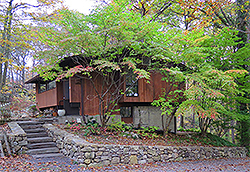 A rare opportunity to own an historic home with a carriage house in the heart of Cold Spring. 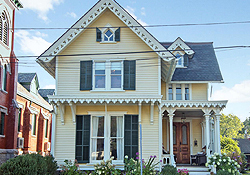 This home was built in 1855 and lovingly restored, keeping its character, charm and elegance. It has 5 bedrooms, 3.5 bathrooms, 10 foot high ceilings, gourmet kitchen, 3 fireplaces plus a carriage house. 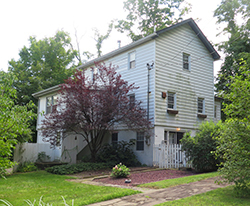 It is a short walk to Metro North commuter RR, the Hudson River, village shops and school. In the village, but not in the limelight! 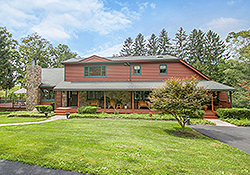 This sprawling contemporary log cabin sits on 2 acres of privacy in Nelsonville (within Philipstown), close to cafes, restaurants, shops, and Metro-North train station in nearby historic Cold Spring.Enjoy scenic mountain views and an elegant country lifestyle with 3,000 sq ft of luxurious living space encompassing 4 bedrooms, 3.5 baths, cathedral and vaulted ceilings, hardwood and tile floors, an open, airy floor plan, attached 3-car garage, a private in-law suite, and numerous amenities. A rare opportunity to purchase a traditional sandstone detached villa set within a substantial area of private garden ground and which offers outstanding elevated open aspects to the front across the Firth of Clyde and beyond. 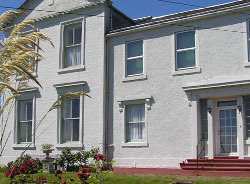 The original part of the building is believed to date from the middle of the 19th century with a subsequent 2 story extension added a number of years later. 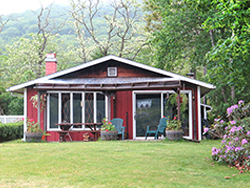 A private, year round community and a perfect environment for second home, offers a "Deck House" style home on 2.6 wooded acres. The two (2) bedroom, one (1) bath home has an open plan living room, dining area and eat-in-kitchen for all to enjoy and join in the entertaining. The sliding glass doors to the large deck and patios overlook a landscaped rock garden and a brook and offers outdoor space for more social enjoyment. A 2000+ square foot owner built ranch style home with 6 bedrooms, 2 full baths on main level, living room with raised hearth fireplace with heatalators , eat-in-kitchen with access to large enclosed family room with slate floor and cedar cathedral ceiling awaits the imaginative new home owner. 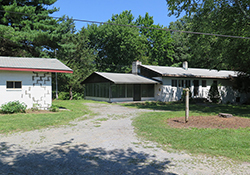 New Complete Renovation of approx 1100 square foot residence or office in a B-2 zone sited on 1/2 acre of land. It consists of one (1) bedroom, new appliances (refrig, dishwasher, stove, microwave, sink with new countertops), living room with spiral to loft area, SGD to deck and new wood flooring. Washer dryer hookup in storage basement. 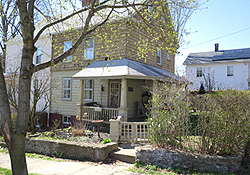 A well kept 3 family home off Main Street in the heart of the village. The home consists of one (1) 3 bedroom apartment with bath, one (1) 2 bedroom with 1.5 baths and one (1) bedroom with bath. There is a laundry room for tenants use, off street parking and a one car garage. Convenient to RR commute, shopping and village life. 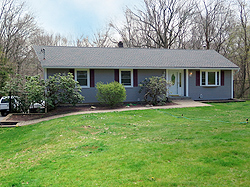 A pristine 3 bedroom, 2 bath ranch style home located on one acre (-+) awaits your new home. The home is located on a cul-de-sac and close to commuting highways, schools and shopping. It has a new roof (2013), well pump (2013), C/AC, 2-275 gallon above ground fuel tanks, generator hookup and a pellet stove in the living room. The home borders protected lands at rear of property and has a terraced rear yard. A must see to appreciate the fineness of this home. 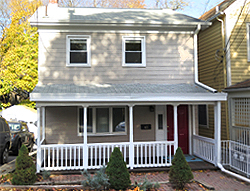 A vintage Cold Spring village home with a front rocking chair porch that is near the commuter train, Hudson River park and the Hudson River. The home has 2 bedrooms (new wall to wall carpeting in both bedrooms) and a tiled full bath, living room with wood flooring and a tiled eat-in-kitchen with stainless steel appliances. From the kitchen there is a rear porch and access to the rear yard and garden. The fenced yard is also accessible from the heated walkout basement which has the laundry and plenty of storage. Use your imagination for the basement. The home has upgraded electric and lighting and a new System 2000 furnace. The home has two (2) bedrooms, one (1) bath (with tile floor), eat-in-kitchen with ceiling fan, S/S gas stove, dishwasher and refrigerator. The formal dining room has hardwood floors and fireplace mantel with electric heater and access to lower level. The living room also has hardwood floors and a brick fireplace. The 2nd level has two (2) bedrooms with wide board floors and bath/tub. The 3rd level is a finished attic for a playroom or office. There is additional storage in the eaves and also an attic fan. The partially finished basement has a family room with brick fireplace with propane insert, laundry and utility room. The hot water heater is new and roof is 6-7 years old. 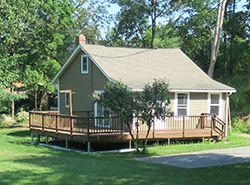 Old charm with updated amenities. 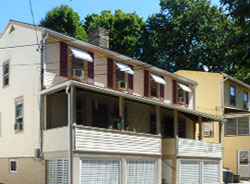 Historic records show Jonathan Hustis Tavern C.1700 was located on this site. The "suds may be gone but the atmosphere is still there.The entry level has foyer, 1/2 bath, laundry room, large living room with beamed ceiling and beautiful wood flooring, large stone fireplace with propane insert and 2 additional room. The upper level has MBR with bath/shower and additional BR/office. The lower entry (also a patio) has a galley style kitchen with electric stove, deep S/S sink, refrig, plenty of counter space, desk area and dining area. The lower level has customized wood ceiling and walls. Perfect place to resurrect the refreshment stop while on the trail. C/AC, ceiling fans, workshop, stone walls and mature garden make a home spot for the weekender or full time Cold Springer. 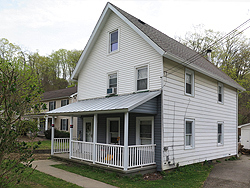 A sturdy village home with a rocking chair porch and a stream that runs alongside your home that meanders thru Nelsonville and Cold Spring and empties into the Hudson River awaits your viewing. The living room and dining room have hardwood floors and the dining room has built-in cabinetry. The kitchen has a tile floor, gas stove and access to rear yard and furnace room. The 2nd level has 2 good size bedrooms + a nursery/office and all with hardwood floors. A large 2 car garage also comes with the property. 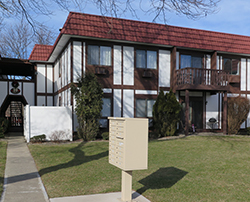 Totally updated condo unit (The Park) with 2 BRs, 2 full baths and a joy to own. The kitchen has granite counters with a custom tile floor and backsplash, custom made cabinetry and kitchen has been made to open to dining room and living room for an entertaining feeling. The large living room has access to the balcony which has views of protected areas, a large DR/DA also ins in this area. The substantial master bedroom has an updated tiled bath and also a walk-in closet, There are newish windows and SGD, custom light fixtures and a full size stackable washer/dryer. There is a community pool for your enjoyment and it is close to shopping and commuter roads plus easy access to commuter rail. it is presented subject to errors, omissions, changes and withdrawal without notice.